Just when you thought that no one else would be stupid enough to make another twitter app that lets you post your RSS feed to your time line, along comes TweetMyFeed. TweetMyFeed is yet another humble attempt at something which other services, TwitterFeed for instance are doing perfectly. 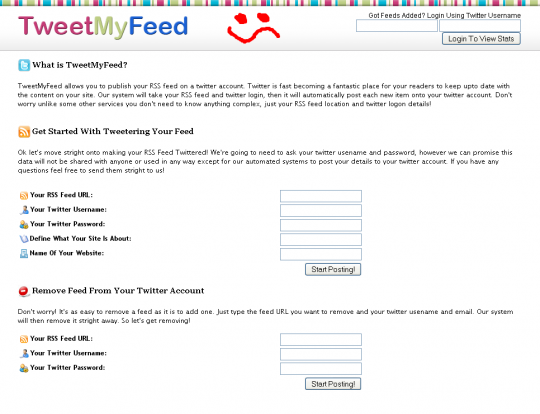 In fact, TwitterFeed gives you more control by letting you publish your feeds to other services along with Twitter. Another fine example is PingVine, which even allows you to set the frequency of the updates up to the order of seconds. So why would anyone choose TweetMyFeed? Well they claim to be the simplest way of doing this. If you define simplicity by counting the number of form fields you have to fill in, I’d say that PingVine is more simple than TweetMyFeed. The do have a feature that PingVine lack though; you can delete your feed from there system if you want to. I’m not against any developer, but reinventing the wheel really isn’t very productive unless you have something unique to add to it. Still I’d bet that people would use this service. In fact, you can use any of these services if you just want to publish your feeds; its just a matter of preference – or Google. Ran 15 queries in 0.142 seconds.